Each of your sites has its own Settings view. Provide a link to a web URL where your site's content may be presented to your end users. An entry here will activate the shortcut link in the left navigation menu next to the site name for quick access to preview your work. 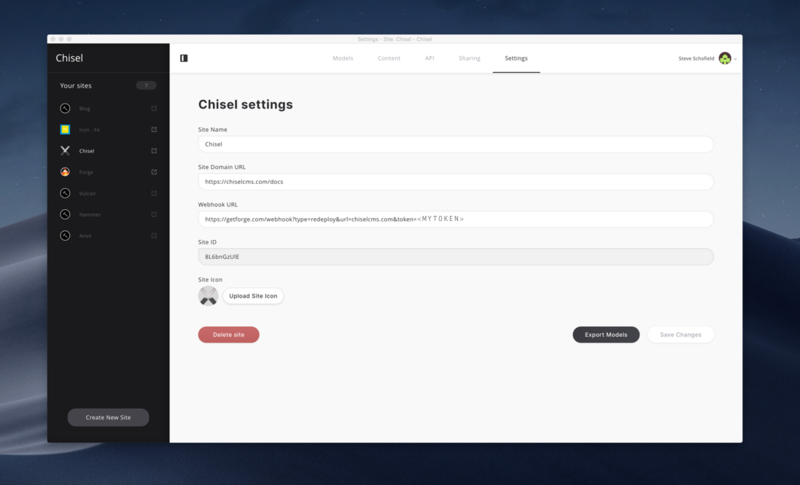 This is the destination where Chisel will send outgoing notifications of change events for your site's content, for example, when a new content item has been published or when changes to an existing item has been published or a content item has been removed. The URL format will depend on the service you want to notify. In this example we are sending a notification to our Forge hosting that will trigger an automated build and deployment of our site as part of a continuous deployment workflow. This is a unique identifier for your Site. You will require this when you want to access data for your site via REST API or for example, in our Hammer integration. This value is readonly and cannot be changed. You can upload your own custom icon that will be displayed in the left navigation Sites list.